Back in the 1950s, the US intelligence community coined a term: “blowback”. It referred to the unintended consequences of a covert operation that ended up damaging one’s own cause. In the three years since he was elected to lead the Labour party, Corbyn has faced non-stop accusations that his party has an endemic “anti-Semitism problem“, despite all evidence to the contrary. Of late, Corbyn himself has become the chief target of such allegations. Last week the Daily Mail led a media mauling of Corbyn over disparaging comments he made in 2013 about a small group of pro-Israel zealots who had come to disrupt a Palestinian solidarity meeting. His reference to them as “Zionists”, it was claimed, served as code for “Jews” and was therefore anti-Semitic. Corbyn’s supporters have argued instead that he is being subjected to a campaign of smears to oust him from the leadership because of his very public championing over many decades of the Palestinian cause. Al-Jazeera has produced two separate undercover documentary series on Israel lobbyists’ efforts in the UK and US to interfere in each country’s politics – probably in violation of local laws. Only the UK series has been aired so far. Shia Masot (right) with Israel’s new Ambassador to London Mark Regev (right). 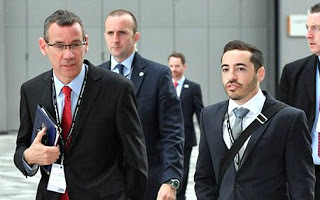 It showed an Israeli embassy official, Shai Masot, both plotting to “take down” a Conservative government minister seen as too sympathetic to the Palestinian cause and helping to create an anti-Corbyn front organisation in the Labour party. This week Alain Gresh, the former editor of Le Monde diplomatique, published significant quotes from that censored documentary after viewing it secretly in Dubai. The US lobby’s aims and practices, as reported by Gresh, closely echo what has happened in the UK to Corbyn, as he has faced relentless allegations of anti-Semitism. The US documentary reportedly shows that Israel’s strategic affairs ministry has taken a leading role in directing the US lobby’s efforts. According to Gresh, senior members of the lobby are caught on camera admitting that they have built up a network of spies to gather information on prominent critics of Israel. But until the broadcasting of the Al-Jazeera documentary last year no comparable effort had been made to shine a light on the situation in the UK. In fact, there was almost no discussion or even acknowledgement of the role of an Israel lobby in British public and political life. One of the largest and most effective groups in Corbyn’s parliamentary party is Labour Friends of Israel (LFI), most of whose members are not Jewish. LFI takes some of the party’s most senior politicians on all-expenses-paid trips to Israel to wine and dine them as they are subjected to Israeli propaganda. He referred to them as “Zionists” and suggested that the reaction of this particular hardline group to a speech by the Palestinian ambassador had betrayed their lack of appreciation of “English irony”. 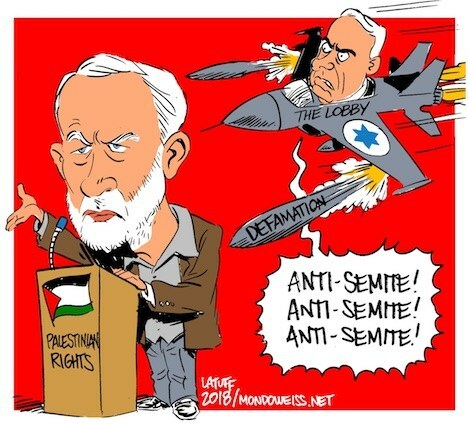 Israel’s lobby, echoed by many liberal journalists, has suggested that Corbyn was using “Zionist” as code word for “Jew“, and that he had implied that all Jews – not the handful of pro-Israel zealots in attendance – lacked traits of Englishness. Jonathan Sacks, Britain’s former chief rabbi, told the New Statesman this week that Corbyn’s comment was “the most offensive statement made by a senior British politician since Enoch Powell’s 1968 ‘Rivers of Blood’ speech”. In that notorious speech, the right-wing politician sought to incite race hatred of immigrants. In a now familiar pattern to lobby claims, Sacks relied on the false premise that all Jews are Zionists. He conflated a religious or ethnic category with a political ideology. The Labour leader has held his ground on this occasion, pointing out that he was using the term “in the accurate political sense and not as a euphemism for Jewish people”. However, the terms “anti-Semitism” and “Zionism” are likely to prove more treacherous to weaponise against Corbyn than the lobby thinks. As the anti-Semitism controversy is constantly reignited, a much clearer picture of the lobby’s implied logic is emerging, as illustrated by the hyperbolic, verging on delusional, language of Rabbi Sacks. It probably doesn’t require a logician to understand that there are several highly problematic premises propping up this argument. Let’s concentrate on two. The first is that it depends on a worldview in which the non-Jew is assumed to be anti-Semite until proven otherwise. For that reason, Jews need to be eternally vigilant and distrustful of those outside their “tribe”. If that sounds improbable, it shouldn’t. That is exactly the lesson of the Holocaust taught to children in Israel from kindergarten onwards. In Israel, the Holocaust supplies a different lesson. It teaches that Jews are under permanent threat from non-Jews and that their only defence is to seek collective protection in a highly militarised state, armed with nuclear weapons. Fifteen years ago, a US scholar, Daniel J Goldhagen, published an influential essay in the Jewish weekly Forward titled “The Globalisation of anti-Semitism”. In it, he argued that anti-Semitism was a virus that could lie dormant for periods but would always find new ways to reinfect its hosts. This theory is also known as the “new anti-Semitism”, a form of Jew-hatred much harder to identify than the right-wing anti-Semitism of old. Through mutation, the new anti-Semitism had concealed its hatred of Jews by appearing to focus on Israel and dressing itself up in left-wing garb. The other obvious lacuna in the lobby’s logic is that it only works if we completely remove the Palestinians from the story of Zionism and Israel. The idea of a harm-free Zionism might have been credible had it been possible to establish a Jewish state on an empty piece of land, as the early Zionists claimed Palestine to be. In reality, there was a large native population who had to be displaced first. He tells the New Statesman: “Jews did not wish to come back to their land [Palestine] to make any other people [Palestinians] suffer, and that goes very deep in the Jewish heart.” Not so deep, it seems, that Sacks can even identify who had to suffer to make possible that Jewish “return”. In a critique of Sacks’ lengthy 2016 essay on anti-Semitism, a liberal Jewish commentator Peter Beinart noted that the rabbi had mentioned the “Palestinians” by name only once. In a world that was not topsy-turvy, it would be Sacks and the Israel lobby that was being publicly upbraided for their racism. Instead, Corbyn is being vilified by a wide spectrum of supposedly informed opinion in the UK – Jewish and non-Jewish alike – for standing in solidarity with Palestinians. – Jonathan Cook, a British journalist based in Nazareth since 2001, is the author of three books on the Israeli-Palestinian conflict. He is a past winner of the Martha Gellhorn Special Prize for Journalism. His website and blog can be found at: www.jonathan-cook.net.